Press conference at Parliament Buildings, Stormont with Secretary of State for Northern Ireland Karen Bradley. Photo by Philip Magowan / Press Eye. 136 days to Brexit. 665 days since Northern Ireland had a functioning government. But how many days has the Northern Ireland Secretary of State spent in the jurisdiction since January? We don’t know because the Northern Ireland Office wouldn’t tell us. 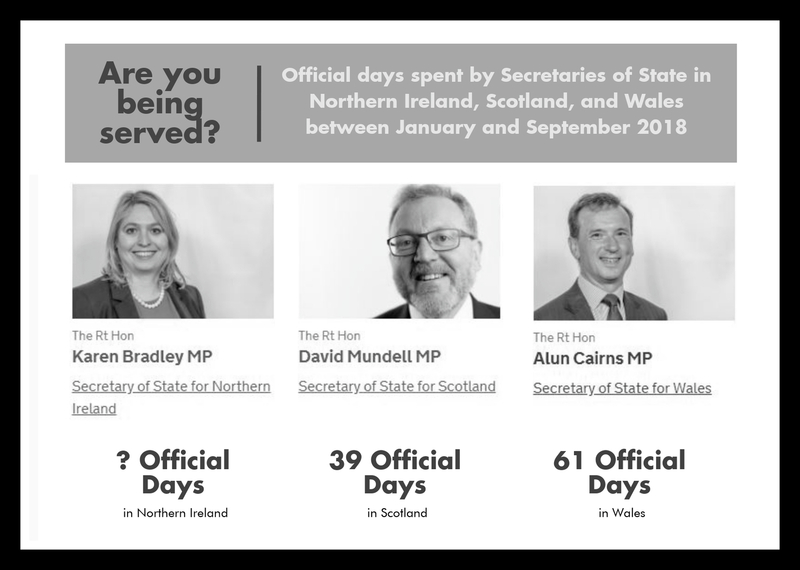 The Northern Ireland Office (NIO) has refused to provide information on the number of official days the Secretary of State Karen Bradley has spent in the country since taking up office on 8 January this year. The decision to refuse a Freedom of Information (FOI) request by The Detail comes as the Northern Ireland Secretary of State’s peers in Scotland and Wales granted a request for the same information. The Office for the Secretary of State in Wales confirmed that Alun Cairns spent 61 official days in Wales between January and September this year, while the Office for the Secretary of State in Scotland confirmed that David Mundell spent 39 official days in Scotland during the same period. The refusal by the NIO to provide information about the workings of the Secretary of State comes at what is a crucial time for Northern Ireland and the future of the UK as a whole. It is less than five months to Brexit and coming close to two years since the last formal sitting of the Northern Ireland Assembly and the need for representation at local and national level could not be greater. In the absence of official information, The Detail estimates that Mrs Bradley spent at least 31 days in Northern Ireland in the first six months of the year. This tally is based on quarterly returns published by the NIO showing what external organisations the Secretary of State met with and on the assumption these meetings took place in the jurisdiction. Quarterly returns were only available for the January to June period. We had also sought a breakdown of expenses incurred by all Secretaries of State and again the NIO came up short. Where the Scottish Secretary of State spent over £53,000 on official business in the first nine months of 2018, the Welsh Secretary of State spent less than £15,000 over the same period, according to information provided under FOI. We cannot tell you, however, how much was spent by the NI Secretary of State on official business as the NIO indicated it would exceed cost and time limits set under FOI legislation to provide this information. We can tell you though, based on NIO returns, that Mrs Bradley did travel by private charter to Cork during the summer at a cost of almost £16,000. The Secretary of State was accompanied by four officials on this flight on 11 June to meet with the Irish Foreign Minister and Tánaiste Simon Coveney. The purpose of that meeting is not clear and we can only assume it was Brexit-related. Irish President Michael D Higgins courted controversy this year for using the Irish government Learjet to travel to Belfast for an engagement. The NIO did not respond to a request for a comment when asked about why it refused to provide information on the Secretary of State's activities in Northern Ireland. See bottom of story for update from NIO after publication. On 7 September The Detail sought details on the number of official days, expenses and allowances incurred, decisions made, and legislation proposed or passed by the respective Secretaries of State (SoS) since January this year. In October the requests were turned down by all of the SoS offices on the grounds that the request was too broad and would be too costly in staff time to locate the information. Undeterred, we refined the scope of our request to seek only the number of official days and a breakdown of expenses - travel, acommodation, subsistence and any other expenses - incurred by each SoS since the beginning of the year. The Scottish and Welsh Offices obliged; the Northern Ireland Office did not. When refusing both of our requests, the NIO estimated it would cost more than £600 or more than 3.5 days in staff time to locate the information sought thus exceeding the cost thresholds set down in FOI legislation. In the absence of any official information from the NIO, The Detail set about carrying out its own assessment. Based on NIO ‘transparency’ releases, we discovered that Mrs Bradley attended 60 meetings with external organisations since taking up her post on 8 January and the end of June. Assessing the Secretary of State’s meeting schedule, we found that these 60 meetings took place over 31 separate days in the six-month period. Returns show that, of the 60 meetings we are aware of, eight related to Brexit, eight to victim issues, eight to NI politics, four to NI economy, and four to equality issues. The remaining meetings were not categorised under themes. Assuming all of these meetings took place in Northern Ireland this suggests that Mrs Bradley spent, on average, at least five working days in the jurisdiction per month. The meetings recorded in Ministerial NIO returns, however, do not give a full picture of the Secretary of State’s diary as they exclude conferences, receptions, media interviews, meetings with government departments, agencies, or representatives of Parliament or any devolved or foreign government. First Six Months: The following interactive timeline shows what external meetings the Northern Ireland Secretary of State had, hospitality received, and overseas travel between January and June 2018. Ministerial returns published by the Scottish and Welsh Offices show that during the same six-month period the Scottish Secretary Mr Mundell attended 115 meetings with external organisations and the Welsh Secretary Mr Cairns attended 86 such meetings. As well as being Ministers of the Crown the three sitting Secretaries also represent their constituencies in Great Britain. 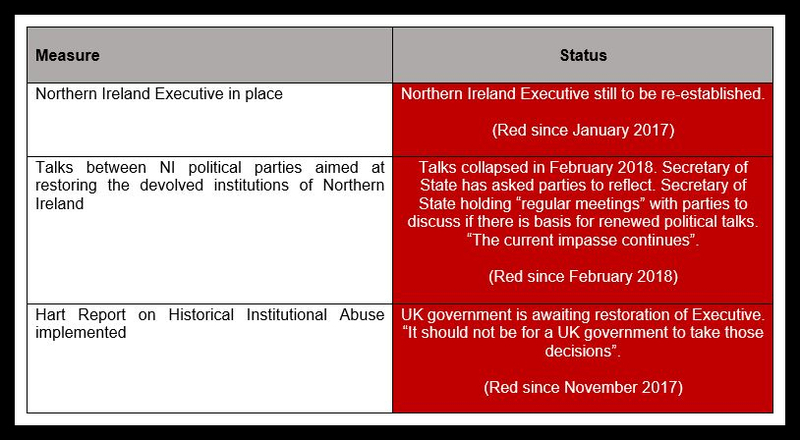 Official meetings: This table shows the number of meetings attended by the Secretary of State in Northern Ireland, Scotland, and Wales with external organisations between January and June 2018 - based on meetings with external organisations as recorded in Ministerial returns. The NIO returns also show that Mrs Bradley received hospitality in the form of match tickets from the English Football League, Rugby Football Union, football association, and the Irish government in the first six months of the year. The Secretary of State also attended lunch or dinner engagements hosted by Ireland Funds, Christopher Moran (Chairman of Co-operation Ireland) and Global Radio. Attempts to establish costs incurred by each Secretary of State while on official business also ran aground, as we could not build a complete picture. Again, where the Scottish and Welsh Offices granted the request the NIO did not, refusing to provide the information on cost grounds. The Scottish Office confirmed that Mr Mundell incurred costs of around £53,000 in the first nine months of the year while on official business in the UK and overseas. The Welsh Office confirmed that Mr Cairns incurred costs of less than £15,000 while on official business in the UK and overseas over the same period. The only information available in relation to expenses incurred by Mrs Bradley suggest that more than £24,000 was spent on overseas travel by the Secretary of State in the first six months of this year. Ministerial returns record overseas travel expenses but not travel costs incurred within the UK. One of the overseas journeys taken by Mrs Bradley involved a private charter flight to Cork to meet the Irish Foreign Minister Simon Coveney on 11 June at a cost of £15,587. Four officials accompanied the Secretary of State on this trip. On the same day, records show that Mrs Bradley met with three external organisations – the Parades Commission, NI Local Government Association, and Survivors and Victims of Institutional Abuse. Other overseas trips included attending St Patrick’s Day celebrations in New York and Washington in March at a cost of £8,099 and travelling to Belgium and France by Eurostar in June at much more modest costs of £263 and £406 respectively. The private charter to Cork for Mrs Bradley and her officials in June cost almost double the expenses incurred for the Secretary of State’s US visit for St Patrick’s Day. The NIO did not respond to a request for comment on the cost of the charter flight, the purpose of the meeting in Cork, or whether any alternative travel arrangements were considered. In the meantime, a Westminster parliamentary committee is keeping a watching brief on the political impasse in Northern Ireland and the fallout from that. The Northern Ireland Affairs Committee has published a series of “situation reports” highlighting issues, such as implementing the recommendations of the historical abuse inquiry, that cannot be addressed in the absence of devolved government. In recent weeks, legislation introduced by the NI Secretary of State to cut the wages of MLAs began to take effect. From November MLA pay was cut by 15% and further cuts are expected to follow in February unless power sharing is restored. Further efforts by Mrs Bradley to bring political parties around the table at the start of November, however, backfired when the meeting was curtailed after 45 minutes to enable the Secretary of State to make a flight. With the exception of the DUP, parties breathed a collective sigh of frustration over the briefing, which some described as “a waste of time”. This follows admissions by Mrs Bradley in September that, on taking up the post, she was not in tune with the local political landscape and how people vote in Northern Ireland – comments she later claimed were taken out of context. The next NIO Ministerial returns are expected to be published before the year-end and may shed further light on the workings of the Secretary of State Karen Bradley since taking up office. But watch this space for further updates as we await a response from the NIO on another refined FOI request seeking the number of official days spent in Northern Ireland this year. 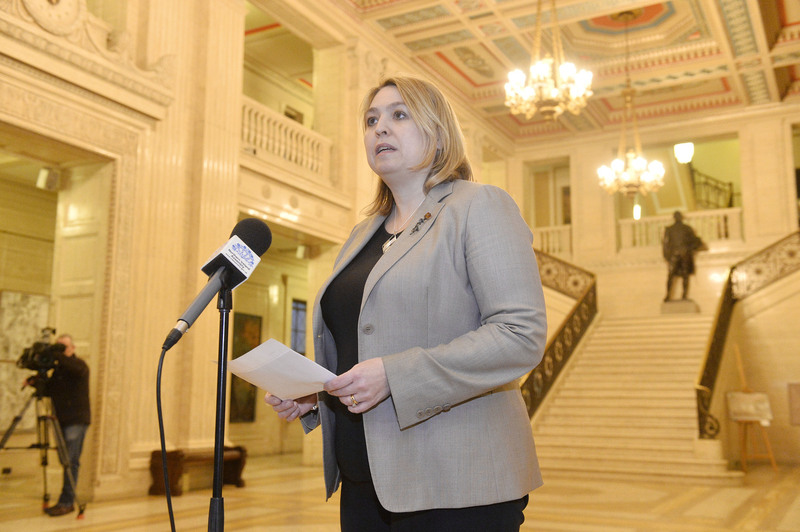 LATEST: Almost ten hours after The Detail published this story the Northern Ireland Office contacted us to confirm that the Secretary of State Karen Bradley spent 42 official days in Northern Ireland between January and September this year. A Northern Ireland Office spokesperson said: "The UK Government publishes an unprecedented amount of data on ministerial travel and a wide range of other subjects and we always comply with the Freedom of Information Act. The Secretary of State spent 42 days in Northern Ireland between January and September." The NIO still has not commented on the private charter flight to Cork in June. The Detail awaits a response to an FOI seeking details of expenses. FURTHER UPDATE: (3 December 2018) The NIO has formally responded to our FOI request seeking the number of official days spent by the Secretary of State in Northern Ireland this year. The NIO has confirmed that Mrs Bradley has spent a total of 51 official days in Northern Ireland between her appointment on 8 January and 30 November. The NIO further confirmed the Secretary of State spent an additional 15 days in Northern Ireland over the same period during which Mrs Bradley had “personal engagements”. To enable our readers to monitor how long Northern Ireland has remained without a functioning government and how many days until the UK leaves the European Union, The Detail recently launched two trackers to count up and count down the days. You can find our Stormont breakdown tracker at the top of our home page, which shows the number of days, hours, and minutes since the Assembly last sat and conducted business on 24 January 2017. Before the Assembly adjourned at 6.23pm that day the Speaker of the House, Robin Newton DUP MLA, commented: "Members, today is our last sitting ahead of the election in March. In the circumstances that this Assembly has not completed the full expected term, the normal conventions at the end of a mandate do not seem to be appropriate." "There may be difficult times ahead, but I wish every Member well, whether seeking re-election or not, whatever their future might bring," he added. You can also find our Brexit countdown tracker in the Brexit section of our website and at the top of the page on all Brexit-related stories, again showing how many days, hours and minutes until 11pm on 29 March 2019.